Square Inc. (NYSE: SQ) stock will start trading tomorrow (Thursday, Nov. 19). If it follows the average pattern for 2015 IPOs, the SQ stock price should see a first-day pop. The average IPO in 2015 has seen a first-day gain of 14%. On Nov. 11, Apple Inc. (Nasdaq: AAPL) said it's developing a payment service that would allow users to transfer money to one another from their iPhones. The tech giant is consulting with a number of banks about the service, including JPMorgan Chase & Co. (NYSE: JPM) and Wells Fargo & Co. (NYSE: WFC). The move would be a direct challenge to other person-to-person payment services like Square and Venmo. As the most valuable brand in the world, Apple's new service is poised to take over the growing mobile payments industry. According to Forbes, it's expected to become a $142 billion market by 2019. However, Apple won't be able to take over the sector easily. Many other mobile payment companies have enjoyed immense growth in recent years. Venmo is the fastest-growing payment service in the United States. 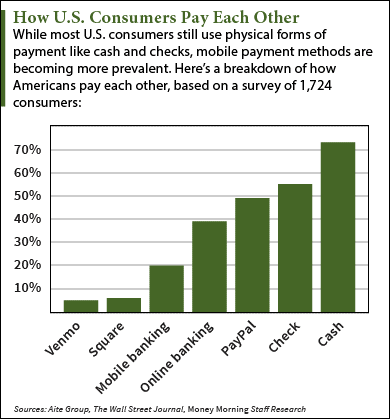 Last year, it accounted for 19% of mobile person-to-person money transactions. About $2.1 billion worth of mobile payments were made using Venmo last quarter. That's up from $700 million during the year-ago quarter. Square has seen similar growth in the number of payments used with Square Readers. Square's gross payment volume (GPV) – the total value of card transactions processed – increased 61% from $14.8 billion in 2013 to $23.8 billion in 2014. Its GPV is set to surpass $30 billion by the end of this year. But don't let the strong GPV growth convince you to invest in SQ stock right away. In fact, there are a number of risks facing Square stock's potential profitability. Alex McGuire is an associate editor for Money Morning who writes about upcoming IPOs. Follow him on Twitter for the biggest news on SQ stock.